I’ll admit to those of you playing Buzzword Bingo that I know the word engagement is most certainly on your card. I’ll chip in that perhaps it’s there precisely because engagement is worth talking about. Exploring engagement is really about helping employees identify for themselves, Why should I care? And how much of my effort is really required to max out my rewards? How many of you have thought about engagement in relationship to your own work? Have you asked your employees and other stakeholders about the character of their engagement with your organization? Or is it, something that you just feel? Articulated Needs: Am I getting what the organization promised me? Un-articulated Needs: Am I getting what I want, but haven’t told anyone in the organization? Unknown Un-articulated Needs: Are there things I could get that I haven’t even considered? The first level of Articulated Needs, known to both organization and employee, likely comes from a formal or tacit job description and is the focus of most discussions regarding employee satisfaction and performance. Strategy: When a formal review is performed, it’s good to provide a written list of the organization’s promises for the employee to check against. The second level of Un-articulated Needs can be most insidious in diluting an employee’s engagement. Here, a set of expectations is known only to the employee, leaving up to luck, the organization’s ability to deliver. Meanwhile, the employee is thinking, why can’t they meet my needs? Strategy: Ask the employee, is there anything you expect from the organization that you haven’t told us, and we haven’t met? Perhaps it’s more frequent feedback, a raise, more visibility in the organization. Then follow that with a discussion of how the organization might align to help deliver on those needs. Often there are job benefits that an employee hasn’t even considered. This third level of Unknown Un-articulated Needs is potentially the most powerful in securing an employee’s buy-in, loyalty and increased productivity. This is the gift that the organization gives to transform good employees into ambassadors for the organization. Strategy: Ask the employee to finish the thought, It would be great if the organization and this job would provide me with what? Why would that be great? and What else would be great? Find some areas in which the organization could satisfy those needs. Perhaps it’s personal or career development opportunities, such as a chance to grow a network, learn a new skill or have a platform for industry-wide visibility. 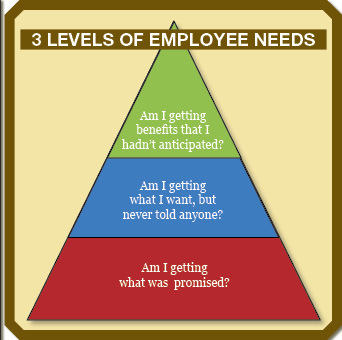 All of these employee needs for engagement should be balanced against the organization’s needs from the employee. If the employee isn’t certain that his or her rewards are equal to or greater than what the organization expects from the employee, then burnout will ensue and the engagement won’t be sustainable. And because needs and responsibilities change, this equation should be revisited on a regular basis. If you’re wondering what employee engagement has to do with branding, then you are probably missing one of your most potent branding tools. Smart organizations brand from the inside out; that is, they understand that before you begin building a brand with customers, the employees have to buy into and be passionate about delivering the best brand experience. Customers can spot a half-engaged employee a mile away, and it certainly dilutes the brand promise beyond the moment of a less-than-satisfying interaction with that employee. In my next post, I’ll discuss how these employee engagement principles might apply to customer engagement. In the meantime, any feedback you have for me would be a gift.